Cheese is the biggest thing I have missed since discovering my dairy allergy. Most of the rice or soy-based cheese I have tried tasted like plastic…until now. 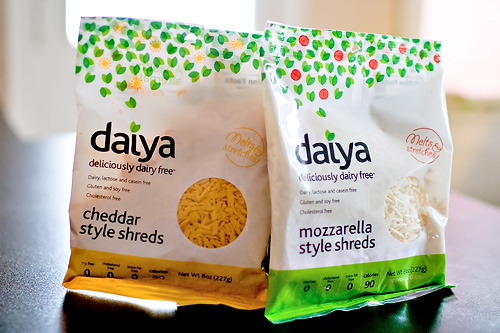 I recently bought some shredded pepper-jack vegan cheese from Daiya.It doesn’t exactly taste like real cheese if eaten raw. But it’s great if you melt it between a tortilla. This past weekend, I took my stash with me on a trip to the peninsula. I stayed on an Indian reservation that only had a pizza restaurant. There were no other restaurants within 50 miles. So, I asked this restaurant if they could make me a pie using my vegan cheese. They did and it was the best pizza ever….or at least since the last time I ate a real cheese pizza over eight months ago! Today, I picked up more pepper-jack, some mozzarella, and some cheddar. For lunch, I used the cheddar to make a grilled cheese sandwich. It tasted just like the real thing. I’m not preparing a pizza for tomorrow’s lunch using the mozzarella. So, if you can’t do dairy and want a cheese that melts great and tastes almost as good as the real thing, I recommend Daiya vegan cheeses. Pick some up at the local Whole Foods.